Two hovercraft have been sent by Gloucestershire County Council to Cumbria to help with rescue efforts after major floods struck the region. Hundreds of people have been affected after water levels in the town of Cockermouth reached 8.2ft, (2.5m). Gloucestershire's fire service mobilised the two hovercraft and six rescue pilots at 0500 GMT following a formal request for assistance. They are expected to rescue stranded people and help with animal welfare. Gloucestershire's chief fire officer, Terry Standing, said: "I spoke to Cumbria's chief fire officer and he felt that hovercraft assistance would be of tremendous value in helping with the serious flooding that has hit Kendal and Cockermouth. "We can't be sure how the hovercraft will be used until we have had the chance to assess the current situation on the ground, but these hovercraft are much more versatile than normal rescue boats. "They have the ability to go outside of normal water courses and travel across open flooded areas regardless of obstacles, including those that may be submerged and invisible." 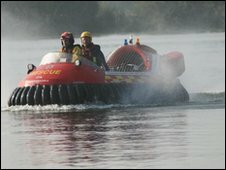 The hovercraft were bought by Severn Trent Water for Gloucestershire Fire and Rescue Service in 2008 following the flooding crisis which hit the county in 2007.